The substance legends are made of. 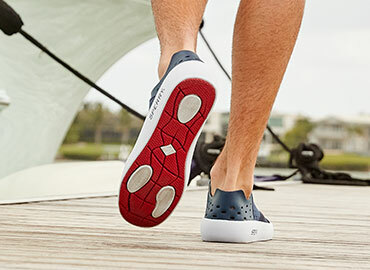 For over 80 years, Sperry has been the very definition of performance, quality and comfort. Inspired by founder Paul Sperry’s uninhibited spirit, these timeless styles transcend boundaries and span generations. Quick! Name a faster draining boat shoe. That was probably unfair. We can’t think of one either. In the time it took you to read the headline, Sperry’s hydrophobic (water-repelling) shoes got wet and then drained all the water out without missing a step. Although this time around, you’ll find these rebellious icons of the prep world have a decidedly modern twist. Embracing your individual style yet tying everything together. Today. Tomorrow. Dare we say another 80 years?